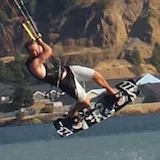 Freestyle contests have been around for years in the kiting community. The 2011 Kite 415 Photo Shoot Contest gives you (no matter your skill) a chance to show off your latest moves. Whether you like to keep your kite low and parked while throwing powered wake-style moves, huge old school board-offs, simple styled out grabs and rolls, or mega loops, then this is your time to shine! Best 2 pictures and the funniest one win ! Prizes : Cabrinha Custom Kiteboard, Golf bag, Harness and many more ! Sherman style Party with Dj Ollie and Guest ! Last edited by Ovi on Sat Aug 06, 2011 10:39 am, edited 14 times in total. Last edited by rvv on Thu Jun 23, 2011 9:17 pm, edited 1 time in total. Welcome to Kite 415 annual Photo Shoot Contest!!! Is going to take place at Sherman Island Saturday July 2nd. Ovi - have you published photos from this event yet? It was not much to publish. I am thinking to redo it in another day when more people will come to Sherman for good winds. But sincerely, you have a great picture, so please email me at contact@kite415.com and I will send it to you. So we thought to reorganize the event and hope we will have more wind this time. "Last edited by Ovi on Thu 04 Aug, 2011 9:10 am, edited 13 times in total."